For the first time in a single reference, this book provides the beginner with a coherent and logical introduction to the hardware and software of the PIC32, bringing together key material from the PIC32 Reference Manual, Data Sheets, XC32 C Compiler User's Guide, Assembler and Linker Guide, MIPS32 CPU manuals, and Harmony documentation. This book also trains you to use the Microchip documentation, allowing better life-long learning of the PIC32. The philosophy is to get you started quickly, but to emphasize fundamentals and to eliminate "magic steps" that prevent a deep understanding of how the software you write connects to the hardware. Applications focus on mechatronics: microcontroller-controlled electromechanical systems incorporating sensors and actuators. 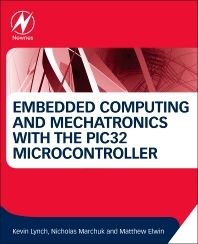 To support a learn-by-doing approach, you can follow the examples throughout the book using the sample code and your PIC32 development board. The exercises at the end of each chapter help you put your new skills to practice. 3.3 What Happens When You Build? 3.4 What Happens When You Reset the PIC32? Kevin Lynch received his BSE in Electrical Engineering from Princeton University and his PhD in Robotics from Carnegie Mellon University, and he is currently Professor and Department Chair of the Mechanical Engineering Department at Northwestern University. He has been teaching mechatronics at Northwestern for over 15 years, and he has been awarded Northwestern’s highest teaching awards. He publishes and lectures widely on his research in robotics. He is a Fellow of the IEEE. Clear and complete description of how to use the PIC32 microcontroller through the use of the NU32 development board. It helped me start up with Digilent's MAX32 ChipKit. Clearly explained with lots of easy to understand examples. I really liked that i could downloaded the e-book in different types, altough i only use the PDF format. After some minutes after the purchase i gave an e-mail about i can download the book soon, but i did not thing that it would be 5 minutes. I am in love with the linked contents. The program code in the book i think it shoud be colored, at least about the e-book, in this way it would be easier to read, but i think it is the author's responsibility.